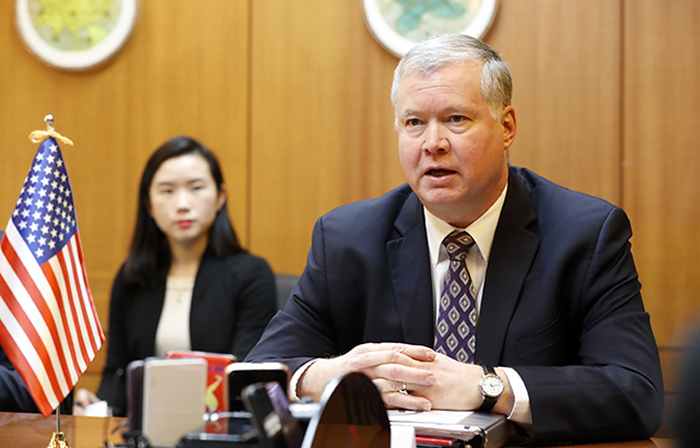 The U.S. Special Representative for North Korea, Stephen Biegun, urged South Korea on Monday to ensure that rapprochement efforts with the North do not compromise sanctions against the renegade country. In a meeting with visiting National Assembly Speaker Moon Hee-sang and other South Korean politicians in Washington, Biegun reportedly said the U.S. is not opposed to warming inter-Korean relations, but stressed that cross-border activities must take place "within the framework of international sanctions." Biegun was also quoted by a member of the South Korean delegation as saying it "may be possible" to resolve the main sticking points in pre-summit negotiations with North Korea if the two sides agree to a denuclearization timetable, although there are only two weeks left before the summit. He reiterated that his negotiations with North Korea in Pyongyang last week were "productive" but more time is needed to find a compromise. Biegun claimed that the talks, which led to no substantial agreement, were a chance for both sides to "sound out" what they want, while differences will be narrowed in the next round of talks.